Cute little Truffle seemed to be smiling after being given a tender blade of grass to munch on. Of course, she was even happier being set on the grass for quality lawn mowing time. No time to smile now, this piggy has work to do! Look at all that grass! My pigs are so envious of your lawn. 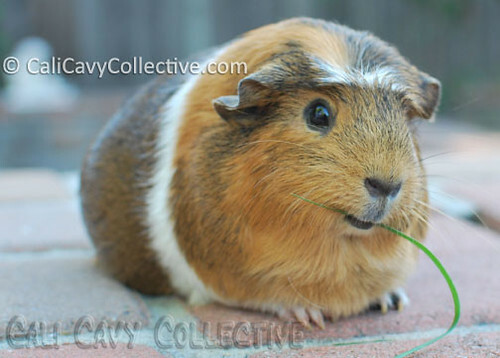 Awww, Truffle looks so much like the late lamented Captain Pig in these photos. Every time I spot a lookalike to one of my past pigs I want to pignap him/her. And feed them piles of food. Is there ever any pig you (and myself) don't want to pignap and feed piles of food and then cuddle? That is true. Even when visiting the zoo I end up spending far more time in front of the guinea pigs exhibit plotting ways to take them all home rather than seeing the other animals. Need a bigger handbag.